We can certainly figure this one out, with the caveats presented in one of my last articles – all these speeds that we measure will be with respect to something specific, and also arbitrary. So we can find out how fast you’re moving on the Earth’s surface because the Earth is rotating, relative to standing at the North Pole, where you would spin in place. We can figure out how fast you’re moving because the Earth is orbiting the Sun, relative to standing at the Sun. And we can figure out how fast we’re moving around the galaxy, relative to standing at the very center of the galaxy, and spinning that way. Fair warning: this is going to get complicated. All of the motions I’m telling you about will be constantly changing direction, since everything is on a circular path. For instance, if the sun is setting, your direction of motion is roughly “away from the sun”. If the sun is rising, you’re roughly pointed “towards the sun”, and at midnight and midday, you’re moving sideways, relative to the sun. So let’s start small. You are standing on a spherical planet (more or less) which rotates once every 24 hours. 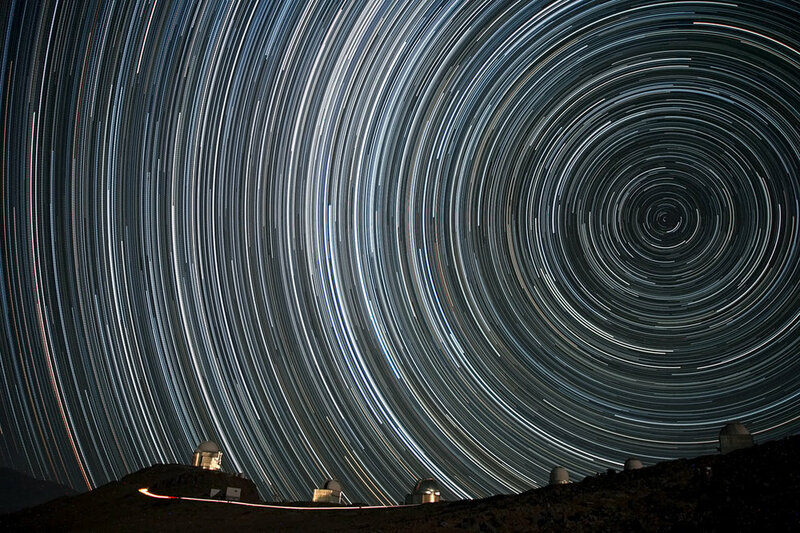 This is a 360 degree rotation in 24 hours, which works out to 15 degrees of rotation every hour. Cool, but you asked for your motion, which means we need to convert from angles to a velocity. If you draw a circle at a fixed rate (say you can draw an inch every second), the length of time you’re going to take to draw that circle depends on how big a circle you’re drawing. With the rotation of the Earth, you have almost the exact opposite problem. We know how much time it takes to draw the circle, but we don’t know how big the circle is, because it depends on where you are on the planet. If your backyard happens to be 3 feet away from the North Pole, then your circle is only 6 feet across, and you have 24 hours to make it around. Unsurprisingly, your speed here is really slow. You’re only going 10 inches per hour. If your backyard is on the equator, your circle is much bigger – it’s the whole Earth across. The Earth is just over 7900 miles from surface to surface, if you tunnel through the middle, which means you have a lot farther to go in the same 24 hours. Your speed clocks in around 1,036 miles per hour, relative to the “motionless” North Pole. We can do this again, scaled up for the Earth’s motion around the sun – it’s a little bit simpler because we know how big the circle drawn by the earth is – 1 astronomical unit, or just under 93 million miles lie between us and the Sun, which means we have a 584 million mile journey to make it through before the year is out. You’ll note that 584 million miles is a larger number of million miles than there are days in the year – and indeed this works out to needing to travel 1.6 million miles per day along our circular path. If we break this into units of miles per hour again, we get 66,658 mph. To combine your motion around the Earth with your motion around the sun, you should add the two together, taking into consideration the relative directions. If you motion around the Earth happens to be pointed in the direction of the Earth’s motion around the sun, you need to add the two motions together. If you happen to be pointed away from the direction we’re moving as a planet, then you need to subtract the two. If you’re at the North Pole, or very close to it, this addition and subtraction makes no real difference to our 66,600 mph motion along our orbit, since you’re going almost 0 mph in the first place. There’s one more complication in adding these two things together! The direction of your motion because the Earth is spinning (90 degrees from our axis of rotation) is not lined up with the direction of the motion of the Earth around the Sun. Our rotation is tipped sideways by 23 degrees. In that case, even if you’re pointed mostly toward the direction we’re moving around the sun, you’re also pointed up a little (or down a little). It’s like walking in a diagonal line, forward and to the right, but then realising you only cared about moving right. The forward motion you made doesn’t really help with moving to the right. We can work out how much of our motion was “to the right” in the direction of the motion around the sun, and sum just those two segments together, but we can’t forget about our “up/down” motion either. If you figure out the geometry, our 1,036 mph of motion at the equator is equivalent to going 954 mph to the side, along our direction of motion. Or against our direction of motion – remember that as the planet rotates, our direction of motion is also changing, so depending on the time of day, our rotation around the planet will add an extra 954 mph at most, subtract 954 mph at most, and at the least consequence, make no change whatsoever, all relative to our hypothetical viewer in the Sun who can see us no matter what side of the planet we’re on. So your motion will appear to be somewhere between 65,700 mph and 67,600 mph in the direction of the planet’s motion, plus an up-or-down component somewhere between 0 mph and 400 mph depending on season and time of day. It’s the same verse again for calculating the speed of the solar system around the Galaxy’s center, but with an extra round of calculating angles. Our solar system is about 8,300 parsecs from the center of the galaxy – where one parsec is 19,170,000,000,000 miles. (This sort of enormous number gets inconvenient, so for any kind of science, I would prefer to calculate things in parsecs rather than in miles.) With our best measurements of our own speed around the center of the galaxy, we’ve estimated our speed to sit somewhere around 220 kilometers every second, or 492,126 miles per hour. Our last set of numbers once again does not add easily, as the solar system sits at a 60 degree angle relative to the Milky Way galaxy – so if you do the math again, you can work out that we can at most add or subtract 34,156 mph to our sideways speed, getting us to somewhere between 526,282 mph and 457,970 mph. You’ll only hit those extremes once a year, at the right time of day, and it will only last an instant – most of the time we’ll be sitting somewhere much closer to the 492,126 mph average. What's in a Jet from a Black Hole?